Before I saw Avatar, I was dismayed at the reports that the film, having taken 12 years to gestate in the mind of James Cameron, was as derivative as they come. Even from the trailer, it was clear we were looking at some weird mash-up of Pocohontas, Dances With Wolves and bloody Ferngully. Played out by giant Smurfs, no less. Wow. Special. It is all absolutely true as well. Actually, no, I haven't seen Ferngully, so I'll withdraw that one. And the Smurfs are much better close-up, so I'll let that one go too. But there is no escaping that the plot is prosaic and dumb. The dialogue is just awful, without a hint of irony and stuffed so full of exposition that any intelligent 12 year-old will have worked out the ending in no time. The pacing is bloated and uneven with a environmental message delivered like a sledge-hammer. You may also choose to take exception to the depiction of US military, but I think this well publicised criticism is a bit unfair and too easy a target. But in any case, make no mistake, this is not a proper 'film'. However, what I have just described is like any other blockbuster movie of the last decade at least. Big, dumb, copying lots of other films and missing the point is business as usual for Hollywood and so it should be judged as such. It's no good whining about the script being written in crayon; it's our fault for listening to the hype about it being a "game changer". Nope. It's another Phantom Menace. Another Matrix even. So if we should judge against its own kind, then it is unquestionably superb, rollercoaster entertainment. One of the best big movie experiences you could ever hope to have, because that's what Cameron does better than anyone. Action. On an epic, explosive level and he stamps his authority here. The scale of this film is just astonishing and the last half hour, a cathartic tsunami of a battle scene. The effects are probably the best you will see. Pandora is a breathtaking creation. 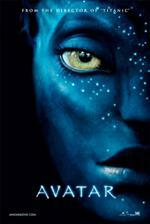 I wasn't convinced by the Na'vi on the trailer, but in the film I simply forgot they weren't real! I can't say better than that. The story for all its faults, is well performed and does have a lot of heart. Jake's (Sam Worthington) story is convincing, if you're so inclined. If you're going to copy, copy from the best because maybe a little soul will rub off. And visually, it would be easy to assume it is one-note, but Cameron has some elegance here, especially in his discrete slow motion and a fascinating shot of a "horse" type creature, bathed in flame. Just look over James Cameron's history. He has got very little originality for writing; in fact True Lies is probably his best film on a personal creative level. Terminator was a superb idea in its simplicity, exploited even better. Aliens is just as exploitive of Alien. Terminator 2 was simply a remake of the first with a bigger vision. Titanic was big and stupid, but looked fantastic. Why the heck should Avatar be any different? What all those films have in common is they are not boring. He also commands great casts. Sigourney Weaver is impressive as always and Sam Worthington has taken a lot of flak, but I found nothing wrong with him. Stephen Lang chews the scenery to great effect and Michelle Rodriguez and Giovanni Ribisi impress too. But the absolute star for me was Zoe Saldana. She is gorgeous in a beautifully judged role. Kudos again to the effects, that they didn't hide a single note. I'm so relieved to have enjoyed this as much as I did, despite the pointlessness of 3D, which was more annoying than anything else. Actually, I'm glad Avatar wasn't a 'proper' film. It hopefully means proper film-makers won't jump on that particular bandwagon and will leave it to all the showmen! Don't get me wrong, it had its moments, but I'm very much looking forward to seeing Avatar again without a pair of sunglasses on. The colours were so muted in favour of this gimmick. But however you see it, What you go into a James Cameron movie for is unashamed excitement. Avatar is bloated, but when the action kicks in, I defy you not to hold your breath. Hahaha the title of this review sums up Avatar perfectly. On one hand I wanted to give it a high review becuase of the first truley immersive cinema experience I have had, but on the other I wanted to take it down for the somewhat dull storyline that is stitched together from almost every other sci fi film in history. I agree with you on Zoe Salanda, she was fantastic. It's another Phantom Menace. Another Matrix even. What are you trying to say here? Personally (and obviously it comes down to opinion) I would never put Phantom and Matrix in the same league. I just rewatched Matrix yesterday after a long time and was amazed how it held up, how it actually had a few ideas amidst all the style and how beautiful it looked (watching it on Blu-ray it was almost irritating...). Phantom may not be as bad as many say it is, but it sure is not anywhere as interesting as Matrix. He has got very little originality for writing; in fact True Lies is probably his best film on a personal creative level. I agree on all accounts regarding Cameron's history. However, it might be helpful to some that True Lies is basically a remake of a french film. That's a good point. Dammit. I picked Phantom Menace and Matrix specifically. The former should have been the benchmark for Avatar, while The Matrix was the last big movie that everyone said was going to change how such movies are made, like Avatar is with 3D. However, I always felt that The Matrix was good, but overrated. It's... easier... to like Avatar as it isn't trying to be clever or pretend it's something it isn't. The sci-fi side is old hat, but when you watch it, you can just dismiss it and have fun which I think was Cameron's intention. "A good man has to know his limitations" as quoted in an entirely unrelated review. The Matrix is also old hat yet somehow has this "oooh, aren't we clever" air about it. Which they certainly aren't. Honestly in some moments, I think Morpheus is the worst mainstream movie character for years and that includes Jar Jar! And I do love the film overall. Honest! Honestly in some moments, I think Morpheus is the worst mainstream movie character for years and that includes Jar Jar! And I do love the film overall. Honest! I am lacking the word ("thick"...? ), but I do see what you say about Morpheus. When have you seen Matrix last? Because like I said, I found it actually holds up rather well. At this point bullet time is no longer gimmick, just style (surprisingly little used within the film!). Sure, some of the ideas I mentioned are laid out with rather broad strokes, but it's buckets of fun too (for that matter, similar things as for Avatar apply); I haven't cheered at my TV screen like that for a while (the big shootout scene with the SWAT team in the hallway near the end). Oh it's undoubtably fun and superbly staged. It wasn't so long ago I last saw it and I have the Blu-Ray. It's just me being picky! There was a time, especially before the sequels proved my point, when some fans couldn't hear a bad word against what they considered to be the sci-fi benchmark, despite an obvious (to me) lack of substance. I always liked it, but the plot could have been much better and the story didn't hold up to scrutiny at all. Ghost In The Shell as I recently discussed is far superior as a proper sci-fi idea. HA! I hadn't heard that. It's hilarious! He should let proper authors spin it off as Lucas did with Star Wars. That's why I mentioned Phantom Menace, because Avatar has heart and structure like the original trilogy and if Lucas could have recaptured that magic for PM, I doubt Cameron's film would have been so impressive. There was a time that Lucas knew his limitations (there's that line again!) and allowed for some fantastic extensions of his universe. If I was going to read a book about anything to do with Avatar I would love one from the creature design department. A book on the whole universe though doesn't interest me a lot. That is excellent! "Support our troops against smurfy-cats and teddy-bears! They're dangerous!" I know I'm late to the party but I watched Avatar last night. Nothing worth writing to your first girlfriend but it's not a bad movie as long as, like you said Jon, it's taken for what it is, good entertainment. Of course you know me, I always need to complain about something. I was a bit bothered by the metal they wanted to mine being called Unobtanium. They could have tried to do better than calling Unobtanium something that is hard to obtain, especially when the word has already been used in similar circumstances in 2003 in one very bad movie called "The Core". I did enjoy Avatar anyway althoug I'm a bit disappointed that all this display of fantastic special effects is only used to back a very dumb plot that we've seen thousands of time. Big bad American wants ore, big bad American is powerful, big bad American starts war, nice little people defeat big bad American..............doh ! Well, to be fair, at least Unobtainium is not an inventium of the filmmakers at all. There is a Wikipedia article on it, too. The term seems to be around since the late 1950's. I do agree that they should rather have used a made-up term. I believe there is asimilar term used in other sircumstances? Also I have heard "Raritarium" before.